If there is one genre that seems to continually appear in theaters these days, it’s none other than found footage films. If you’re like me, then you absolutely cannot stand this style of filmmaking. It’s not that the style makes for a bad concept, it just that the genre has been done to death, and each film seems to follow the same format. Normally this sub genre resides in the land of horror. But every now again, you will see this style in a different movie format. This is where “End of Watch” comes in. 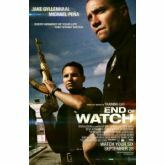 The story of “End of Watch” deals with two cops and their daily lives on patrol as they deal with the Los Angeles crime scene. The plot: the life of a police officer. This major theme is the strongest factor driving the story. The movie knows what it’s about and does a great job interpreting a police’s officer’s lifestyle. But the movie does get dragged down by it’s major plot points. It is not that each point is bad, but they do get underplayed and really do not have that major of an impact. Aside from that, the story is rather solid. The perspective of a cop is both compelling and unique. The two cops in this film are Brian and Mike, played by Jake Gyllenhaal and Michael Pena. As the film starts, you get to know the two characters very quickly. For most part, they turn out to be really enjoyable. You see that both cops can be childish at times, but when things get serious, they know how to handle themselves. To top it off, the chemistry between Gyllenhaal and Pena is outstanding. They manage to bring a very realistic feel to the relationship between two partners. Unfortunately, the supporting cast gets left in the dust. I do enjoy the likes of Anna Kendrick, but the remaining characters seem underdeveloped; which is not to say the performances were bad, I was just hoping for a little more. Now comes the major question: does the found footage perspective work for the film? To be honest, the camera work of “End of Watch” is a double edge sword. At some points in the film, the footage is really distracting and made me feel very nauseous. Not to mention that you might question why everyone in this film seems to have a handy cam on them at all times… but I guess that’s just found footage thing. Aside from that, this is definitely one of the better found footage films out there. The movie is portrayed by several different kinds of cameras; from handy cams to security footage; and it seems to fit in the context of the movie. However, what I liked most about the found footage element is that even though it is a major factor, it never forgets that is a movie. Nor does it forget that subject the subject matter behind this film is the livelihood of being a cop. “End of Watch” turns out to be a very unique cop movie. But that is not to say the film doesn’t have its issues, primarily in story and character development. Though I do have my issues with this film, I think “End of Watch” is worth seeing. It’s not only a unique found footage film, but also, in fact, a very solid movie. Have you seen “End of Watch?” Leave your thoughts about the film in the comments section below!